Welcome to another extraordinary QUILTsocial issue! Don't miss the 11 essential tips for quilting on a domestic machine. 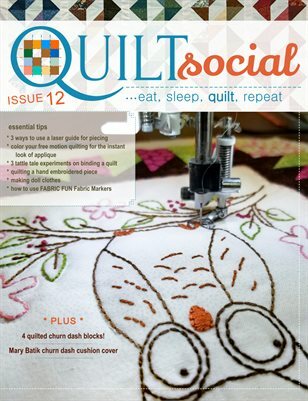 See which machine features help you to accomplish beautiful quilting results. We also look at how we can get even more creative by using FABRIC FUN Fabric Markers to enhance your quilting, make it look like it were applique, make your own 'printed' fabric and add dimension, all using these fabric markers! We're taking a close look at the features of the Husqvarna Viking Designer Ruby deLuxe and Brother Dreamweaver XE, which you don't want to miss. In exploring the features, we also explore what's important to know when quilting a machine embroidered piece and a hand embroidered piece - what's the difference? Find out in this issue! Included are several quilting projects using Northcott fabrics, including one of Banyan Batiks latest, Mary Batik. And make sure you don't miss the drop dead gorgeous Birds of Paradise quilt by none other than Elaine Theriault.